The WMH Survey Initiative is a project of the Assessment, Classification, and Epidemiology (ACE) Group at the World Health Organization coordinating the implementation and analysis of general population epidemiologic surveys of mental, substance use, and behavioral disorders in countries in all WHO Regions. The WHO Global Burden of Disease Study estimates that mental and addictive disorders are among the most burdensome in the world and their burden will increase over next decades. However, these estimates and projections are based largely on literature reviews and limited and isolated studies rather than on cross-national epidemiologic surveys. 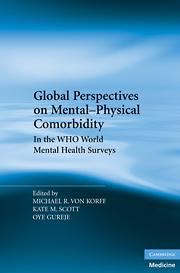 In order to move forward with public health initiatives aimed at addressing the global burden of mental disorders the WMH Survey Initiative carried out rigorously implemented general population surveys that estimate the prevalences of mental disorders, evaluate risk factors for purposes of targeting interventions, study patterns of and barriers to service use, and validate estimates of disease burden world-wide. The WMH Survey Initiative aims to obtain accurate cross-national information about the prevalences and correlates of mental, substance, and behavioral disorders. Included in studies of correlates will be analyses of impairments, other adverse social consequences, and patterns of help-seeking. The WMH Survey Consortium includes nationally or regionally representative surveys in 28 countries, representing all regions of the world, and with a total eventual sample size in excess of 155,000. For more details on the participating countries click here. Sampling: All surveys are based on multistage household probability samples. Internal subsampling is used to reduce respondent burden by dividing the interview into 2 parts. Part 1 includes core diagnostic assessment. Part 2 includes information about correlates and disorders of secondary interest. All respondents complete Part 1. All Part 1 respondents who meet criteria for any disorder and a subsample of approximately 25% of others are administered Part 2. Mode: All interviews are carried out face-to-face by trained lay interviewers. Measures: All surveys use the WMH-CIDI, a fully structured diagnostic interview, to assess disorders and treatment. Disorders considered include anxiety disorders (agoraphobia, generalized anxiety disorder, obsessive-compulsive disorder, panic disorder, posttraumatic stress disorder, social phobia, specific phobia), mood disorders (bipolar I and II disorders, dysthymia, major depressive disorder), disorders that share a feature of problems with impulse control (bulimia, intermittent explosive disorder, and adult persistence of 3 childhood-adolescent disorders including attention-deficit/hyperactivity disorder, conduct disorder, and oppositional-defiant disorder among respondents in the 18- to 44-year age range), and substance disorders (alcohol abuse and dependence, drug abuse and dependence, nicotine). Disorders are assessed using the definitions and criteria of the Diagnostic and Statistical Manual of Mental Disorders, Fourth Edition (DSM-IV) and the ICD-10 Classification of Mental and Behavioral Disorders (ICD-10). CIDI organic exclusion rules were imposed in making all diagnoses. Methodological evidence collected in the WHO-CIDI Field Trials and later clinical calibration studies showed that all the disorders considered herein are assessed with acceptable reliability and validity both in the original CIDI and in the original version of the WMH-CIDI. Studies of cross-national comparability in the validity of the WMH-CIDI are currently underway. Training and Field Procedures: The central WMH staff trained bilingual supervisors in each country. Consistent interviewer training documents and procedures are used across surveys. The WHO translation protocol was used to translate instruments and training materials. Standardized descriptions of the goals and procedures of the study, data uses and protection, and the rights of respondents were provided in both written and verbal form to all predesignated respondents before obtaining verbal informed consent for participation in the survey. Quality control protocols were standardized across countries to check on interviewer accuracy and to specify data cleaning and coding procedures. The institutional review board of the organization that coordinated the survey in each country approved and monitored compliance with procedures for obtaining informed consent and protecting human subjects.